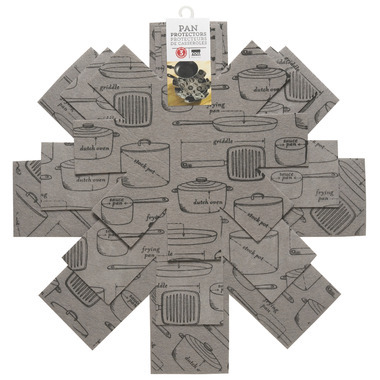 The Now Designs Pots & Pans Protector Set prevents scratches in cookware by placing flexible pan protectors between each piece. Eliminate the clattering of pots and pans, and replace it with peace and quiet when clean pans are put away. Polyester felt. Diameters:10.5/13.5 /16 inch. Great product! Does exactly what itâ€™s supposed to do. Itâ€™s nice to have three different sizes of pads. Can be used for most sizes of pots and pans as well as casserole dishes.